Arrival in Athens airport, transfer to your hotel and overnight. Day 2 : Athens: Athens half day tour, including the Herod Atticus Odeon and the Ancient Theatre of Dionysus. In the morning start with a bus tour of the city. See the Panathenaic Stadium where the first Olympic Games of modern times were held in 1896. Continue and pass by the Prime Minister's residence (ex Royal Palace) guarded by the Euzones in their colorful uniform, the Temple of Olympian Zeus, the Hadrian's Arch, the Parliament and the memorial to the Unknown Soldier, the Academy, the University, the National Library, the Constitution Square (Syntagma). Then continue with a walking tour, starting from the pedestrian street of Dionysiou Areopagitou Street, see beneath the slopes of the Acropolis the stunning open-air theatre, Odeon of Herodes Atticus, one of the legendary sites, is today one of the best places to experience a live classical theatre permormance. This ancient stone theater was built in the Roman times, in about 161 A.D, by the Roman philosopher, teacher and politician Herodes Atticus. Then see the Ancient Theatre of Dionysus, dedicated to the god of Dionysos, regarded as the first sample of Greek theatres and the birthplace of the Greek drama, and is the 1st theater in the world. Continue with a visit of the Acropolis, and see the Architectural Masterpieces of the Golden Age of Athens: The Propylaea, the Temple of Athena Nike, the Erechtheion and finally "the harmony between material and spirit", the monument that "puts order in the mind", the Parthenon. End of the tour and transfer back to your hotel. Overnight in Athens. Day 3: Tour to Archaeological site of Amphiareion & the archaeological site of Thorikos. In the morning depart towards Oropos and visit the Archaological site of Amphiareion and its Theatre. The sacred site of Amphiareion, dating back to the 4th century B.C was dedicated to the hero Amphiaros. According to Greek mythology, he was saved by Zeus when he fought in the doom expedition (which he foresaw) seven against Thebes. Its ancient theatre where musical and dramatic contests were held every four years following the establishment of the Greater Amphiareia festival in 332 BC. The theatre of Amphiareion preserves elements of at least two different phases: the fan-shaped plan of the cavea and the circular orchestra date from Classical times. The reconstructed proscenium, together with the thrones and of the proedria and the dedicatory inscriptions, all form a particular instructive group from an important phase in theatre architecture during the Hellenistic period. Then depart and drive towards the area of Lavrio, to visit the archaeological site of Thorikos and its theatre. The site of Thorikos had been inhabited since the Neolithic period (c. 4500 BC). Prehistoric and Mycenaean settlements existed on Velatouri Hill where the acropolis is now. Tombs of the Late Bronze Age and Early Iron Age are found on the lower slopes of the hill, beneath the Classical levels. The theater was constructed between 525-480 BC and sits below the acropolis, on the south slope of Velatouri Hill. It is unique due to its shape which comprises an elongated layout with an oval orchestra and is the earliest theater ever found in Greece. End of the tour return back to Athens. Overnight in Athens. Day 4: Full day tour to Delphi: Visit the archaological site, its Theatre and its museum. Drive through the fertile plain of Boeotia, crossing the towns of Thebes - connected with the tragedy of king Oedipus, Levadia and Arachova, famous for its colourful rug sand carpets (short stop).Arrive at Delphi. Guided visit of the Museum and the Archaeological area. Inside the archaeological area of Delphi, see also the theatre, that is build further up the hill from the Temple of Apollo and it presented the seated audience with a spectacular view of the entire sanctuary below and the valley beyond. It was built in the 5th c.B.C of local Parnassus limestone and was remodelled several times subsequently. This is where the musical contests (song and instrumental music) of the Pythian games and other religious festivals took place, which made this theatre the intellectual and artistic equivalent to the athletic stadium at Olympia. Return to Athens early in the evening. Overnight in Athens. Day 5: Visit Mycenae- Epidavros theate -Kalamata. 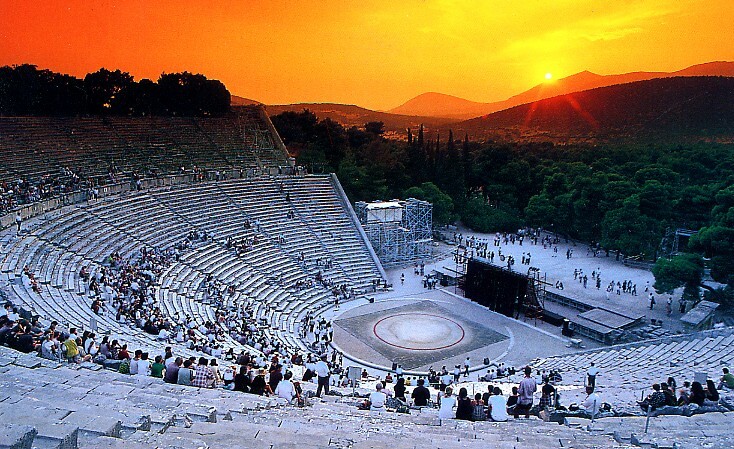 Depart for Epidaurus to visit the theatre (4th century B.C.) famous for its acoustics. The theatre hosted music, drama and singing contests and poetry recitals, spectacles that formed part of the festivals in honour of Asklepios. The theatre of Epidaurus is considered the most perfect theatral structure of antiquity, thanks to the harmony of its proportions, the symmetry of its parts and its exceptional acoustics. The theatre was constructed according to a unified design governed by mathematical principles influenced by Pythagorean philosophy. Today, the monument attracts a large number of Greek and foreign visitors and is used for the performance of ancient drama plays. See also the Ancient Odeon of Epidaurus, a small roofed theater (Odeon) of the Roman period, which occupied part of the atrium of the “Gymnasium” – Ritual Restaurant (a building of the Hellenistic era) in the Asclepion of Epidaurus. The ancient theatre of Megalopolis, which according to Pausanias (2nd century AD) was the largest one in its time, and is part of the Archaeological Site of Megalis Poleos. Arrive in Kalamata and overnight. Day 6: Ancient Messene- Patra. Morning departure and visit the Ancient Messene, A city founded 2500 years ago, and was one of the most important, well preserved excavated cities of Greece, which became the capital of Messinia. Inside the archaeological site the visitor will find sanctuaries, public buildings, houses, fortifications and funerary monuments. The archeological site is located in a beautiful natural environment, and part of it is protected by the mountain Ithomi which is a natural fortress. Imposing walls (about 9,5km length) protected the rest of the city. Ancient Messini is characterized by the “Hippodamian” town planning system, made by the ancient Greek architect Hippodamus, based on the principles of egalitarianism and isonomy which are also the fundamental principles of democracy. You’ll visit its archeological museum, and then you’ll see the Ancient theatre of Messini, constructed during the 3rd-2nd century BC and was mainly used for cultural events and some political gatherings. According to the historic sources, the ancient theater was the place where the King Philip V of Macedonia and Aratus of Sikyon met in 214 BC. The elements of the Ancient Theater of Messini, influenced the theater manufacturing and this theater was the forerunner of the colossal Roman theaters and amphitheaters. Then depart and drive towards the town of Patra and overnight. Day 7: Ancient Nikopolis: –Ancient Cassope – Ioannina. Morning departure and start with a visit the archaological site of Ancient Nikopolis and its musem. Nikopolis (the “victory city”), an archaeological site of great significance, was founded by the Roman Emperor Octavian, to commemorate his victory against Marc Antony and Cleopatra VII of Egypt at the naval battle of Actium (31 BC). Within the archaeological site lie the Roman fortifications, the Monument of Emperor Octavian, the Nymfaion, Byzantine walls; basilicas of the early Christian era and the so-called “Vassilospito” (“King’s House”)the Odeon and the Theater (1st c. AD). The impressive Roman Odeon, was used for lectures, literary and musical contests and theatrical performances during the Nea Aktia religious games honouring Apollo. Being adjacent to the agora, it probably operated as a bouleuterion (council chamber) for the remaining months of the year. The great Theater of Nukopolis, built at the time of Emperor August, is one of the largest and most important structures of its kind in Greece. Then continue with a visit of the archaeological museum, which displays fascinating exhibits of the long-lasting existence of the city in both Roman and Early Christian times. Depart and visit Ancient Cassope, 20 km from Nikopolis. The size of the ancient city, the agora, the two theatres, and prytaneion, unearthed by archaeologists, all indicate that it was the tribe’s cultural centre. The ancient theatre of Cassope built in the southern foothills of Zaloggo was originally built in the 3rd BC and would have had a seating capacity of approximately 5.000 – 6.000 people. Depart towards Ioannina and overnight. Day 8: Ancient Theatre of Dodona & Frontzos Theatre- Ioannina. Morning departure to visit the Ancient Donona. The most spectacular feature of Dodona is the well preserved Hellenistic theatre, and reminds us of the importance of art in people’s lives as well as the attention paid to it thousands years ago. The theatre was built in the time of Pyrrhus (3d c.BCE) for the purposes of hosting dramatic competitions during the Naia festival. It is one of the largest theatres in Greece, with a capacity of about 17.000 spectators. The depart to visit the open- air theatre Frontzos, which is an exact copy of the lower tier of the ancient of Dodona and every summer hosts most of the city’s cultural events such as theatrical plays, concerts, etc. Overnight in Ioannina. Day 9: Archaological site & museum of Vergina: Theatre of ancient Aigai - Thessaloniki. Morning departure towards the city of Aigai, (modern name Vergina), the ancient first capital of the Kingdom of Macedonia. Aigai provides important information about the culture, history and society of the ancient Macedonians, the Greek border tribe that preserved age –old traditions and carried Greek culture to the outer limits of the ancient world. Visit the archaeological site, where you’ll see the most important remains such as the monumental palace (ca 340 BC), which was the biggest and one of the most impressive buildings of classical Greece, the sanctuaries of Eukleia and the Monthet of the Gods, the city walls, the Royal tombs of King Philip II, father of Alexander the Great. See the theatre of ancient Aigai where Philip II was murdered was founded in the mid 4th centrury BC. The theatre was never completed and was abandoned in the mid-2nd century BC, when the city of Aigai was destroyed. Depart towards Thessaloniki and overnight. Morning your of Thessaloniki to explore the city. You will see the White tower- the main landmark of the city, the Galerius Arch, the Rotunda monument, the Roman Forum, also known as ancient agora of Thessaloniki. Inside the agora you will be able to visit the restored ancient amphitheatre (Odeion) with its stands and scene. Continue visit the archaeological site and Ano Poli and then depart towards the town of Kavala. Overnight in Kavala. Day 11: Philippi archaeological site: Ancient theatre of Philippoi-Katerini. In the morning depart to visit Philippi and irs the Ancient theatre. The ancient theatre of Philippi is an important and remarkable monument, with remainings of architecture showing that in the Roman times it was used as an arena. It is located at the feet of the acropolis and it is supported on the eastern wall of the city of Philippi. Eventhough it has sustained many changes throughout the centuries and some interventions so that it can host the Philippi Festival, it still preserves many of the original elements. Opposite the ancient theatre of Philippoi there are the ruins on the ancient city. The ancient city took its name in 356 b.c after the father of Alexander the Great, Philippos the II. The excavations have btought to light ruins from the Hellenistic, Roman, Byzantine and Paleochristian period. The octagon, the Roman forum, the paleochristian basicilas and parts of the city walls are some of the most well know. Depart towards Katerini. Overnight in Katerini. Day 12: Dion archaeological site and ancient theatre – Volos (Ancient Theatre of Dimitriadas) – Athens. Depart towards Dion, an area at the foot of Mt Olympus, known all over the world as a very important Macedonian city. It was the summer resort of the Ancient kings of Macedonia, and the findings of graves found in Dion area are also remarkable. Most royal tombs give away the existence of an eminent and thriving civilization. You;ll see the ruins of that civilization in the archaological site of Dion and its museum. Part of them is also the ancient theatre, located in the south of the town of Dion, and in the west of the sanctuary of Demetra. Built during the Hellenistic period, probably in the reign of Philip , the theater has a large stone skene and brick- built seats. Excavations lead to the conclustion that the theatre was probably abandoned after 168 BC, operating in a rudimentary way until the early Imperial period and falling into disuse after the construction of Roma theatres at the area. Nowadays its use is for the Festival, putting an emphasis on opera and folklore events presented by Greek and foreign artists during the summer season. Continue towards Volos and see the Ancient Theatre of Dimitriadas. The theatre is located within the walls of ancient Demetrias, on the site known as “Sta Dontia” (meaning “At the Teeth”, because of the surviving pillars of the ancient aqueduct passing next to the theatre), near the neighbourhood of “Nees Pagasses” in Volos Municipality. The theatre was built simultaneously with the foundation of the city by the Macedonian king Demetrios Poliorcetes, in 294-292 BC. The current situation of the theatre, stripped of its stone seats, was created after the final abandonment of the building in the mid-4th c. AD, while the stage building belongs to the Roman period. The location of the theatre in the city is not accidental. The theatre was built opposite the Palace of the Macedonian Kings and below the hill on which stood the Heroon of the Archegetes and Builders of the city of Demetrias. It has been argued that the theatre served also the needs of a Heroon. Depart towards Athens and overnight in Athens. Today morning transfer to Athens airport for your flight back home.